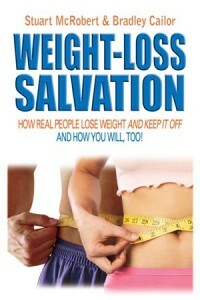 WEIGHT LOSS SALVATION book, by Stuart McRobert, start here first. This book is tailor-made for everyone who has a weight problem — whether it’s 10 to 20 pounds of excess body fat, or over 100 pounds. And it’s especially for people who are tired of failure from fad diets, restrictive diets, gimmicky pills, and exercise gadgets. It’s primarily targeted at men and women who have a lot of body fat to lose, and who aren’t yet into regular exercising; but it will work even better for those who are already exercising well. While the guidance in this book can readily get men under 15% body fat, it isn’t targeted at bodybuilders who are already under 12% body fat and want to get ripped at under 8%. That’s another matter. Weight loss books are usually written by doctors, nutritionists, “personal trainers to the stars,” and self-labeled weight loss gurus, but not by authors who have lost a great deal of weight themselves, and then kept it off. WEIGHT-LOSS SALVATION presents a different approach. One of its authors — Bradley Cailor — is a real-life dieter himself. He has huge experience of dieting because he struggled with his weight for 30 years. Most so-called experts on weight-loss never had such torment. Brad went through the agonizing struggle and eventually solved the problem. From three decades of yo-yo dieting, Brad had regained over 600 pounds of fat, but he always wondered why his diets failed. Following 30 years of experimenting with diet plans and pills, 25 years of researching weight-loss, and interviewing hundreds of successful, real-life dieters and learning what worked for them, Brad applied what he had learned. He shed 114 pounds of fat over one continuous stretch, and then kept it all off. He then teamed up with Stuart McRobert. Stuart’s research acumen, knowledge of exercise and nutrition, and experience of writing instructional books, in conjunction with Brad’s unique, powerful contribution, yielded WEIGHT-LOSS SALVATION. But there’s much more to this book than Brad’s own success story. WEIGHT-LOSS SALVATION reveals how hundreds of real-life dieters lost weight and kept it off; and it also explains the science behind the success. Furthermore, this book thoroughly explains the psychological and physiological issues that are at the root of many people’s weight problems and weight-loss difficulties. And the book explains how to deal with those issues. There’s much more to successful weight-loss than discipline and willpower.